On Monday 24th June we are off to the town of Glastonbury, Somerset. It has been on our radar for a while so we are very excited to wander around for 2 days. We love to travel to new countries but it is equally important to see what’s in your own country. We will not be online for at least a week so please be patient if you drop us a line! A week I hear you cry. You said 2 days of wandering. Ah yes but there is another reason why we are going to this part of the world. Glastonbury festival has been going on since 1970. The first Glastonbury Festival was held on the day after Jimi Hendrix died in September 1970. Organiser and farmer Michael Eavis was inspired to put on the event after he attended a blues festival at the Bath & West Showground. Acts who played the first festival include Marc Bolan, Keith Christmas, Stackridge and Al Stewart. The attendance was 1,500 and it cost £1 to get in, including free milk from the farm. 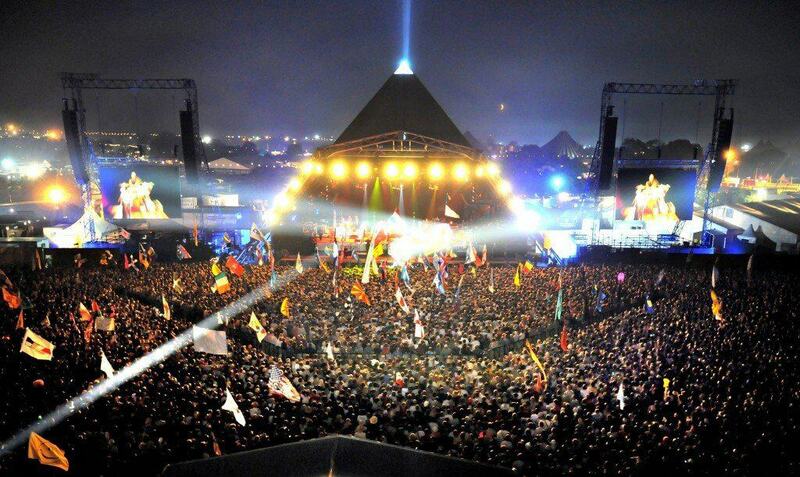 60: the number of officially listed stages at the Glastonbury Festival. Think beyond the Pyramid and Other stages. There are in excess of 2,200 performances listed on the official line-up including speakers, poetry readings and more. 1,300: the number of recycling volunteers who will work on the site, most of them giving their service in exchange for a ticket. In 2005 , an impressive £1,350,000 was raised and paid to charities and good causes, including Greenpeace, Oxfam and WaterAid. 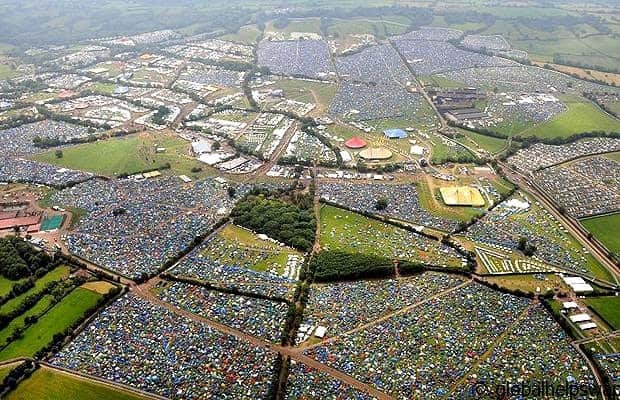 Glastonbury is the world’s biggest open air arts and music festival, covering 900 acres of Somerset farmland. We are so excited!! We try to go every year when we are in England. It feels like we are going on a holiday. 5 days of amazing music, art, poetry, political talks, ultra friendly people and much more. What the facts and figures don’t tell you is the unique atmosphere that the festival generates. 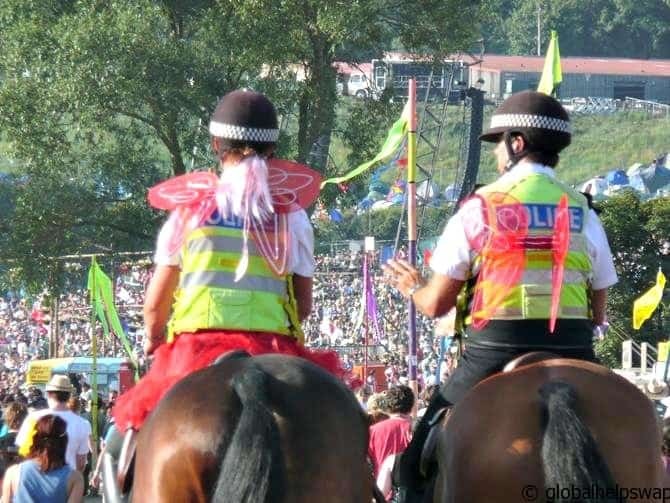 Even though there are 135,000 people attending the festival, it feels like one big happy family as the photo of the police above clearly shows! Unlike other festivals it does not ram its comercial side down your throat. Every year Micael Eavis gives some proceeds to charity. The 3 main charities that have prime locations at the festival are: Oxfam, Greenpeace & Wateraid. They all manage the get thousands of people to sign up and donate during the festival. There is so much to see and do. The size of the festival site is enormous. It is 1000 acres in total (that’s the equivalent of more than 500 football pitches) so the 5 days of the festival entail lots of walking! Each area has a different feel and vibe to it. The Pyramid stage (the main one) is where you will see the biggest acts perform, where as the Green Fields is where you go to have a massage, practice Yoga and even learn how to meditate! There are even Christian, Jewish, Muslim, Hindu, Hare Krishna, and Buddhist tents for you to pray. I am sure there are more religious tents that I have not discovered. It’s a festival like no other. You can just be yourself, have a great time and share the special atmosphere with people who want to do the same. As I mentioned before we will be offline, unplugged and off the grid for 7 days. Bliss! There still will be the scheduled blogs of Tuesdays & Fridays but they will be mainly photo blogs. Have you been to Glastonbury? Please let us know what you think of it below in our comments. As always, Peace & Love. 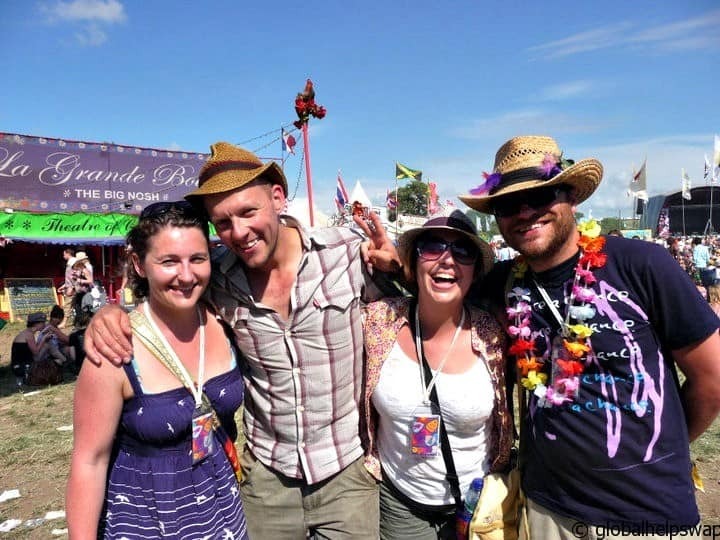 Get the most out of Glasto 2013!